Hamworthy Krystallon said the new scrubber system would help the vessel Linea Messina to meet 0.1% sulphur emissions regulations in EU ports, as well as make it ready for the upcoming 2015 0.1% emission control area (ECA) ruling. Hamworthy Krystallon managing director Sigurd Jenssen said, "This is a landmark moment, not just for Hamworthy Krystallon, but the entire shipping industry. "Bringing Linea Messina on line highlights the validity of scrubbing technology as a viable and cost-effective solution to meet the stringent sulphur emissions regulations, that are serving to transform the shipping industry," he added. "By 2015, ship owners and operators operating in ECAs will have a simple choice – either pay the $300 to $400 price differential for costly distillate fuel or install a scrubber, which typically has a payback of less than two years. Messina has shown what the smart choice is," Jenssen said. 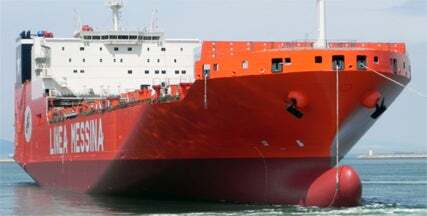 The company had ordered the seawater scrubbers in 2010, to be installed on four new 45,000dwt ro-ro vessels. Each of the ro-ro vessels will feature five scrubbers, comprising four units for the auxiliary engines (each 2MW) and one unit for the auxiliary boiler with capacity of 2.5t of steam an hour. All the scrubbers will be installed within the ship funnel casings. Hamworthy’s Singapore plant will provide vessels with a control system, combined wash-water treatment plant and a new range of super duplex stainless steel which will help the vessels continuously monitor the emission. DNV has approved the installation during testing in October 2011, and it has also achieved RINA classification and MED certification.Following the delivery, the vessel will operate along the African coast as well as in Italian waters. Caption: Linea Messina installs a new scrubber system which can meet 0.1% sulphur emissions regulations in EU ports.